When I was little, and we had a big enough group of people gathered together, sometimes we went to a local ice cream parlor that had an enormous, crazy sundae called “The Kitchen Sink.” It had everything. It was the size of an actual kitchen sink, with an obscenely large number of different flavors of ice cream, covered in all the toppings they had. Every bite was different, and fun, and I ate it with a gaggle of happy friends at birthday parties, after soccer games, or after drama and dance performances. This salad reminded me of that sundae. I had plans for pork tonkatsu (or at least my made-up bastardized version of it) for dinner. I also had nice little brown and serve sourdough rolls from a local bakery. I wanted a big, crazy salad to complete the meal. I like sweet with pork, so I knew I’d be including some candied pecans. I was in the mood for blue cheese, so I added that to the mix. I had gorgeous baby greens, so the bed was determined. I needed some crunch, so I grabbed half a cucumber and what was left of a red bell pepper. 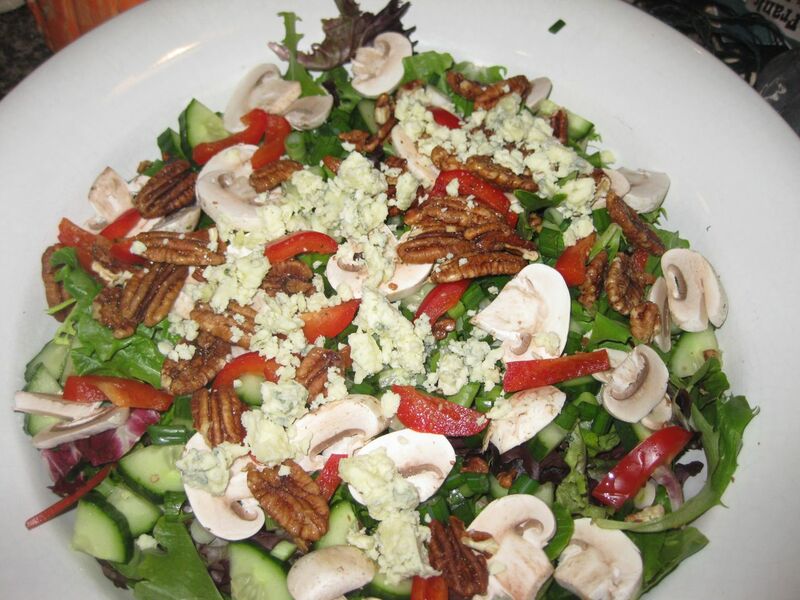 A balsamic vinaigrette would tie it all together, and I tossed in some mushrooms to soak up the tasty salad dressing like little sponges. 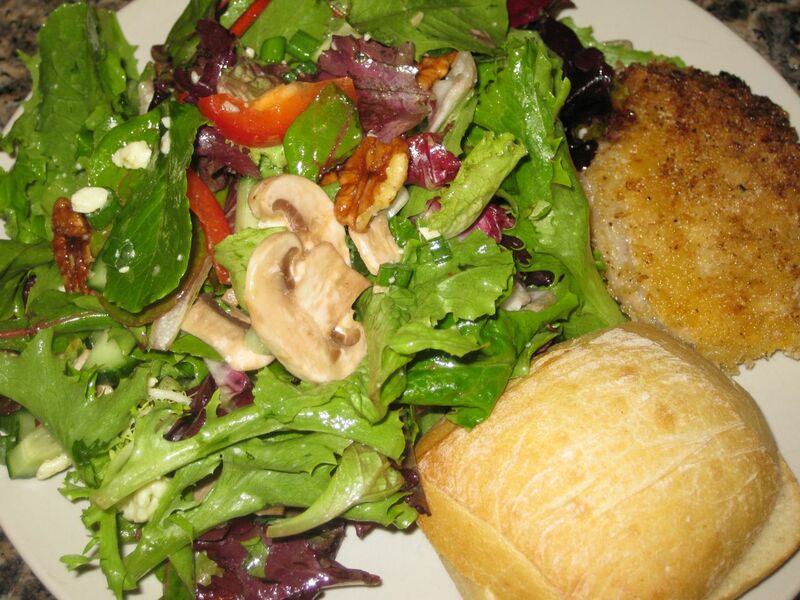 Mushrooms, as you know, are made to be coated in balsamic vinaigrette. It was a wild, vibrant combination. My own little kitchen sink of a salad. Ingredients, ready for their transformation! 6 cups of mixed baby greens. 1/2 red bell pepper, deseeded and sliced. 1/2 english cucumber, quartered vertically and sliced. 1/2 cup crumbled blue cheese. A colorful bed of baby greens, ready for the party. I created a lush bed of baby greens, and quickly mixed up my balsamic vinaigrette in a small jar. I quickly chopped my vegetables and gently laid them in the salad bowl. I added the nuts and cheese, and let it all sit for a moment while I dealt with the tonkatsu. 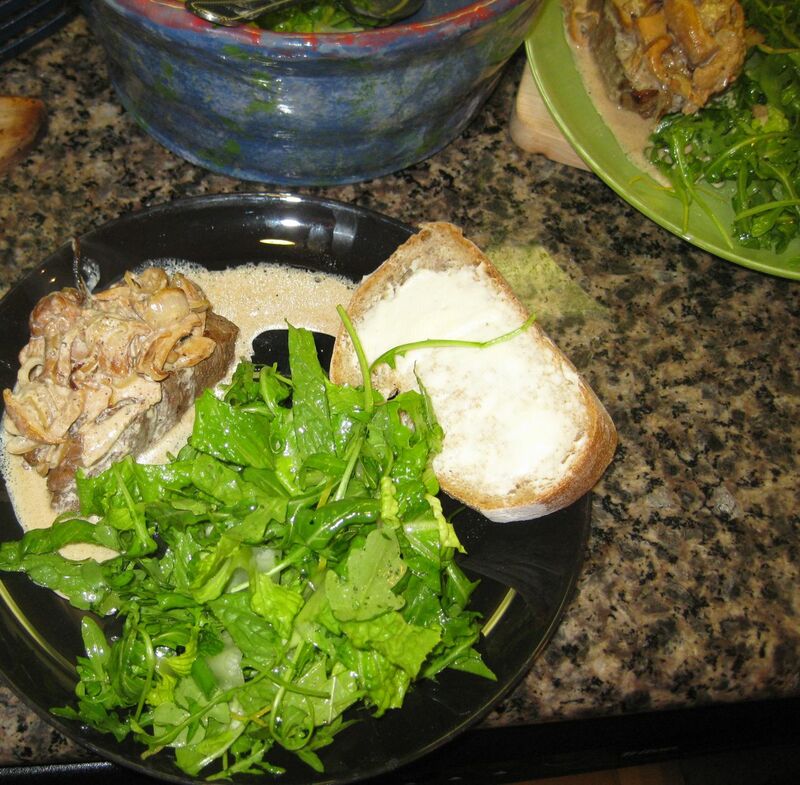 Once the rolls were out of the oven and the pork was ready to eat, I drizzled my balsamic vinaigrette over the salad, tossed it, and served it up. Ready for that yummy balsamic vinaigrette! I got exactly what I wanted — crazy, strong, fun flavors. The sweet nuts worked well with the pork, the mushrooms were delicious, and the blue cheese gave it all an extra creamy flavor kick. I loved it. The kids were not impressed, but my husband gobbled it up right alongside me. On the plate, ready to be devoured! With the nuts and the cheese, I think it would already work as an amazing meal. Easy. Put your salad in a glass or stainless steel container with a tight fitting lid, and your vinaigrette in a small jar, nestled in the greens. Drizzle the dressing (just as much as you want, to taste) over the salad, fork toss or put the lid back on and give it a few quick shakes to combine. Enjoy! We both had busy days planned, so I made two salads, one to go and one for me to eat at home before heading out with the kids for the afternoon. I’ve been on a citrus kick, so I decided to make a lemon citronette. I added navel orange for a sweet citrus punch, as well as daikon, red onion, and lots of cilantro and mint to give it a little bit of an asian fusion feel. I’ve always loved those fresh vietnamese spring rolls, and cilantro plus mint is an easy winning flavor combo for me. The daikon and red bell bepper added necessary crunch, and leftover roasted chicken provided plenty of protein. 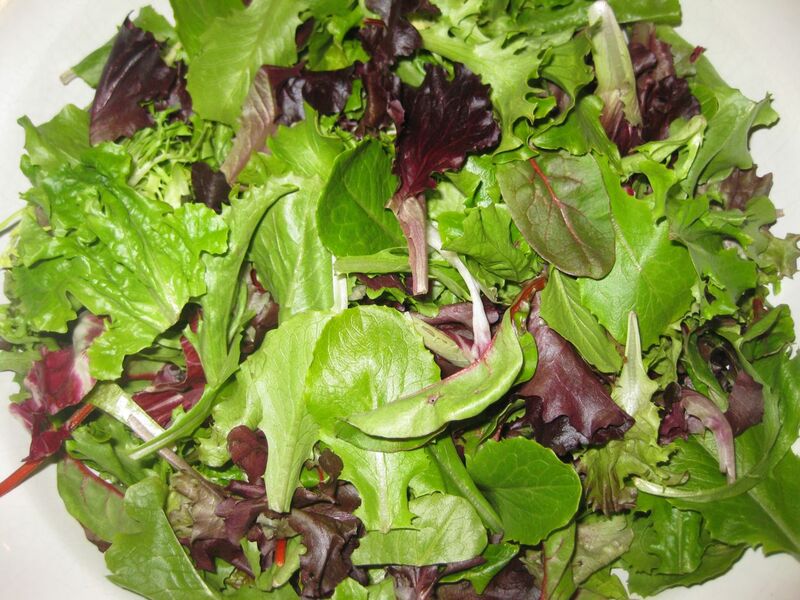 4 cups of mixed greens, including red leaf, mizuna, radicchio, and frisee. 1/2 roasted chicken breast, skin removed, chopped. 1 roasted chicken thigh, skin removed, meat torn into bite sized bits. 1/2 navel orange, peel sliced off, quartered, and sliced. 1/2 persian cucumber, sliced into wheels. 8 thin slices of daikon (use a sharp cheese slicer or a mandoline), halved. 1 thin slice of red onion, quartered. 1small clove of garlic, smashed and minced. I doubled all of the ingredients above to make two identical salads. As usual, I prepared a lush bed of greens and zested my lemon over the top. I mixed up two batches of citronette in small jars, and I added the navel orange to the salad dressing so that it wouldn’t wilt the greens. Then I sliced the veggies, herbs, and chicken, layering it all over the greens. For the daikon, I like peeling it with a vegetable peeler and then using a really good cheese slicer (mine were all brought over from Norway in our suitcases) to get nice thin slices quickly. Once the salads were made, I nestled my husband’s jar of dressing in his bowl and snapped a quick picture. 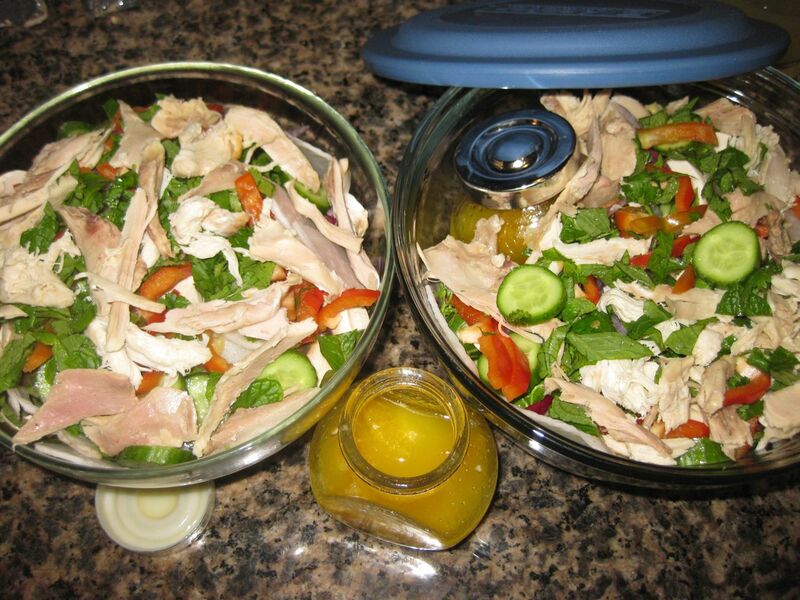 Two salads, one packed to go and one ready to stay home. 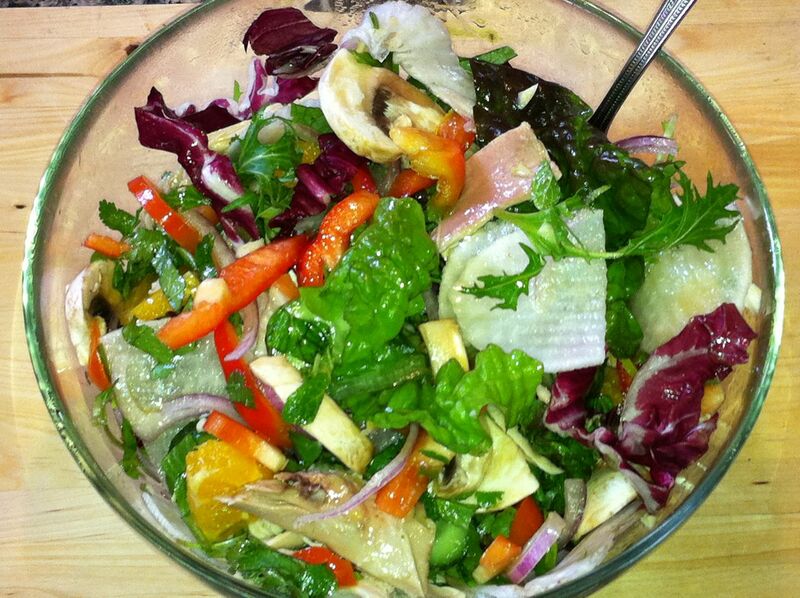 Great meal salad. 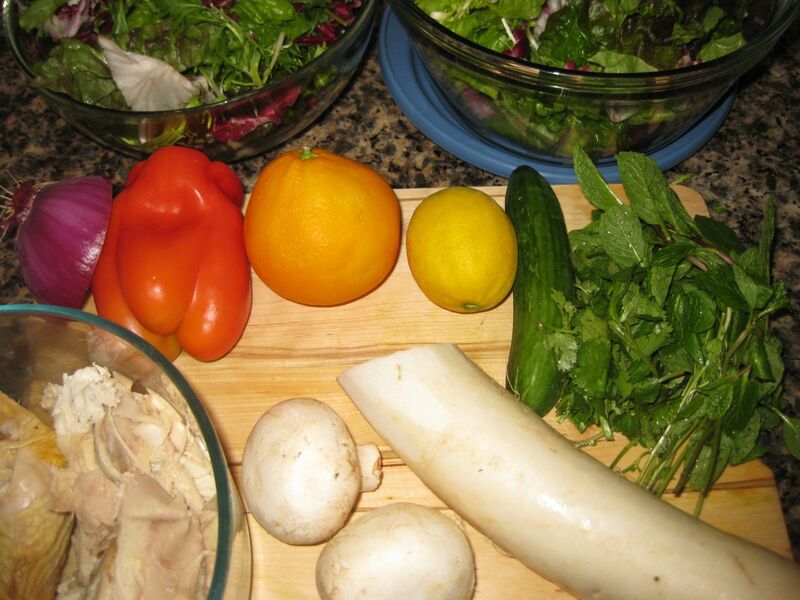 The chicken works well with the citronette, and the diverse veggies and herbs added color, crunch, and flavor. Straightforward and tasty, but not elegant or refined. This is a fun, hearty meal. Enjoy! Juicy skillet steaks. Wild mushroom cream sauce. Fresh sourdough bread slathered with butter. All I needed was a very simple side salad, light and refreshing, to complete the meal. I decided to go with a lemon-lime citronette, with mint and scallions to deepen the flavors. 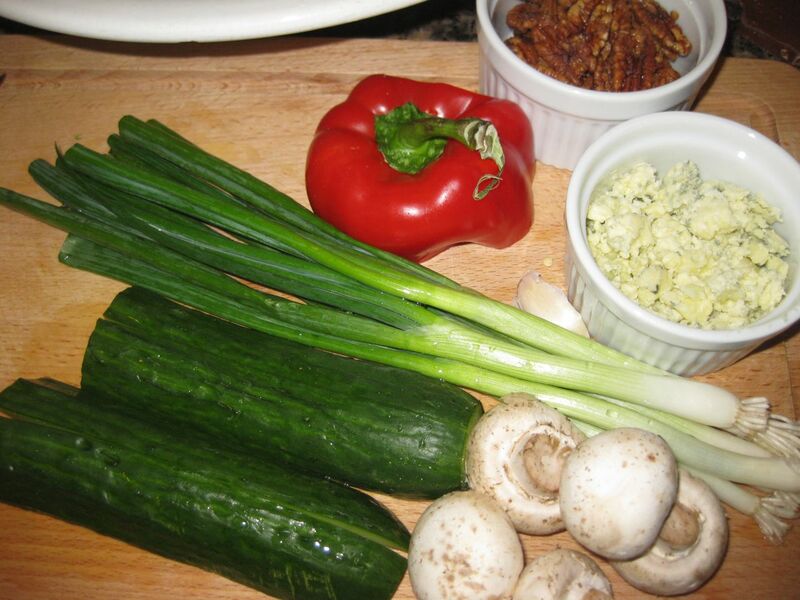 Simple ingredients, ready to prep. 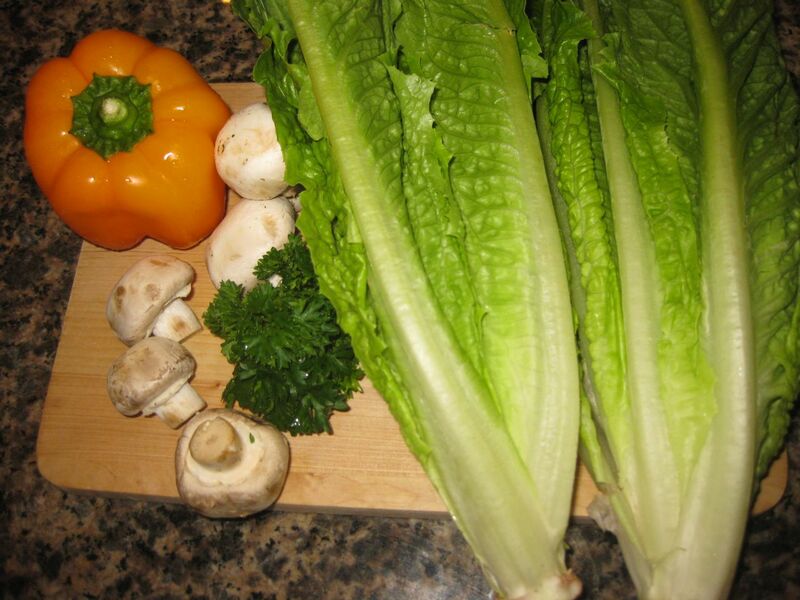 1 heart of romaine, chopped. 1 fistful of fresh mint. 1 T fresh lemon and lime juice. 1 clove garlic, smashed and minced. Plated and ready to eat! 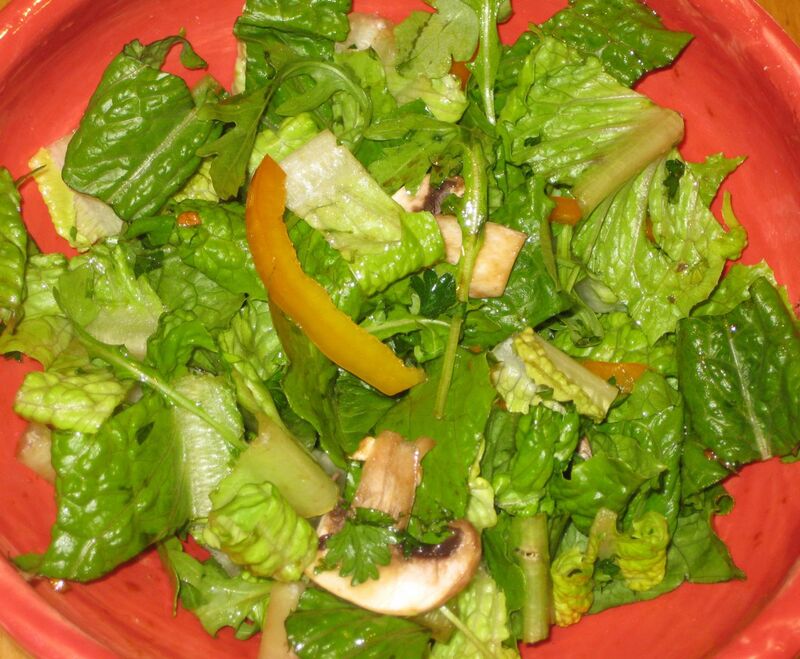 I chose crunchy romaine and peppery arugula to build my verdant bed of salad greens. I zested one lemon and one lime over the greens, then juiced the citrus and prepared my citronette. I used my favorite wide knife to smash the garlic, and then I minced it and added it to my jar of lemon and lime juice. I added maple syrup, extra virgin olive oil, and salt, shaking it up and dipping a leaf of romaine or arugula in to taste it as I went. Once the dressing had the right balance of flavors, I chopped my mint and scallions and added them to the salad bowl. I plated the food, and served it up. 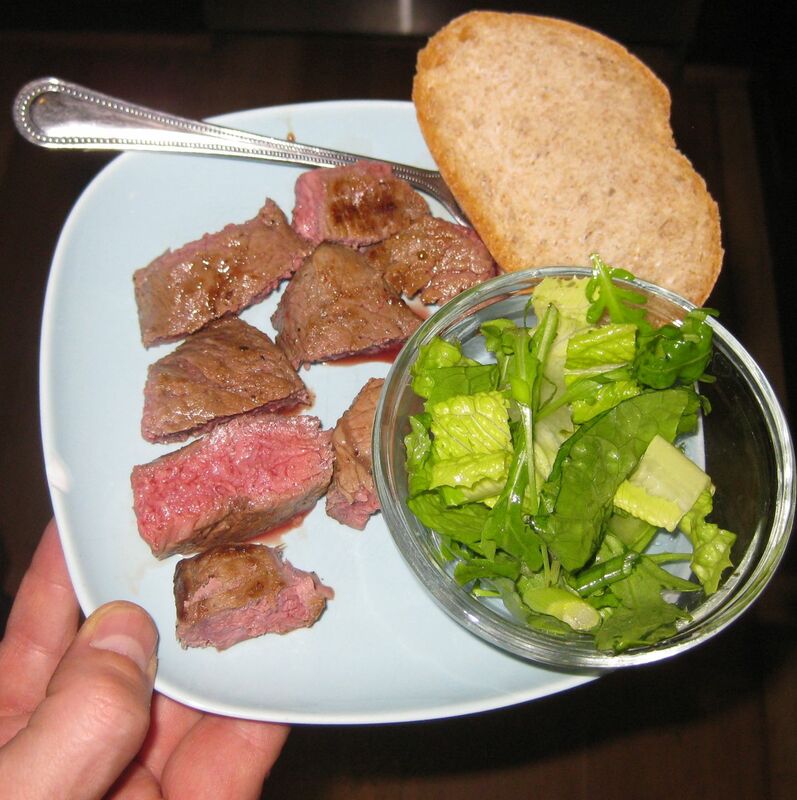 Here's one of our kid's plates, with sliced steak and the food clearly not touching. This is one of those salads that just works. It’s so easy, and so good. A really tasty citronette. A good fistful of fresh herbs (basil, cilantro, tarragon, thyme, and savory are all good substitutions). A sprinkle of scallions. A bed of lush salad greens. That’s really all you need. Perfect side salad. We ate it all. This is a very adaptable combination — add any leftover meat, or tofu, or garbanzo beans, and some extra fruit (citrus, berries, melon) and veggies (radishes, cucumber, mushrooms, peppers), and you’re good to go. It couldn’t be easier. Put your salad in a large glass or stainless steel container with a tight fitting rubber lid, and your citronette in a small jar. Tuck the dressing jar in to the larger container. When you’re ready to eat, shake up the citronette and drizzle as much as you need over your salad, then fork toss and enjoy.